I got a slow cooker (crockpot) for my birthday back in April and I've been enjoying trying out different dishes. I really like the fact that I can put it on in the morning and come home from work to find my dinner cooked. I have a slow cooker recipe a book (two now, in fact) but have also been looking online for recipes. I can't find where I got this recipe from any more but it's very straightforward. Add the chicken breasts - you don't need to brown them first. The heat and timer settings will depend on your slow cooker; I have a setting called "keep warm" which cooks on high for 3-4 hours then keeps the food warm until you turn it off, so it's ideal for making when I am at work. I came home to beautifully tender chicken and a tasty sauce. The chicken definitely shrinks when you cook it for this long and slow cookers are probably better for larger joints of meat but I still think this turned out well. Serve with vegetables and mashed potato. If you want or have time, you can reduce the sauce in a saucepan and add a little cornflour to thicken it, and serve over the chicken. 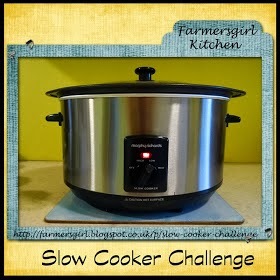 I'm sending this to the slow cooker challenge, hosted by Janice at Farmersgirl Kitchen, as her theme this month is barbecue. Man alive this looks so good. Live a slow cooked anything but this looks particularly sticky and sweet and tender! Delish Caroline! I love my slow cooker too! Ribs are one of our favourite things to cook in it and of course pulled pork always goes down well! Have you ever gone on the blog 365 days of crockpot? There are some amazing recipes, and she even has dessert ones! I didn't even know you could make desserts in the slow cooker but apparently you can, I can't wait to start busting out soups in mine now autumn is closing in!